REUTERS / SUHAIB SALEM Palestinian children watch worshippers as they attend Orthodox Christian Palm Sunday mass at the Saint Porfirios church in Gaza City April 5, 2015. Christians in Gaza are rapidly disappearing amid the Israeli blockade of the Strip and the lack of employment opportunities. 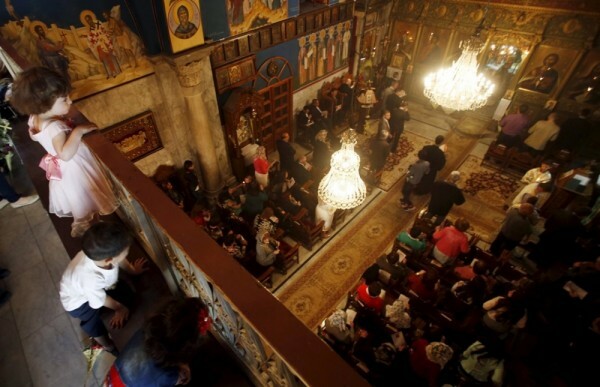 The worshippers at the ancient Church of St. Porphyrius in Gaza believe that they may be the last Christians in Gaza because many of them have decided to leave the place, some in large groups. A few years ago, there were 3,000 Christians in the region but today there are only about 1,200, according to USA Today. While Israel usually does not allow anyone to leave the Palestinian area, some Christians are permitted to visit Jerusalem and Bethlehem during Easter and Christmas. Some Christians are taking advantage of the Christmas season to leave Gaza and begin a new life in another place. If the situation in Gaza continues, religious groups in the area could vanish entirely within 20 years, the report details. Jilder is talking about the militant group ruling over Gaza. The United States, along with other nations, has named the group as a terrorist organization, the report adds. The Israeli blockade has choked good and freedom off the Gaza Strip. The World Bank said its economy is now on the brink of collapse. Morevoer, the United Nations said this year that the Palestinian territory will become unlivable by 2020 due to the Israeli-Hamas war and the blockade, the Gospel Herald reports. Meanwhile, Israeli Prime Minister Benjamin Netanyahu has explained that the blockade prevents weapon smuggling from Gaza to Hamas. Gaza is not the only area where the Christian population is rapidly dwindling. In West Bank, the same reasons have caused Christians to leave, said Palestinian-Christian George Abueed. While the thought of Christianity being wiped out from the Palestinian region pains the community, Christians can do nothing to fix the situation except leave and try to establish more productive lives for themselves.